Whether you plan to walk the halls of history in Philadelphia or if your idea of the perfect family road trip involves beaches and copious amounts of sunscreen, planning ahead can make your road trip safer and more fun for everyone. These tips will help you plan a family road trip everyone in your clan can appreciate. Before you begin making any plans, though, you must first choose your destination. We recommend that you research the region, finding fascinating stories to tell your children to help get them excited about the trip and the things they’ll see and you’ll do as a family. Not only do you want to choose your location, you also need to spend time planning little out of the way adventures to enjoy while you’re there. For instance, on a trip to Philadelphia, the Liberty Bell and Independence Hall may be no-brainers, but don’t forget to include fun family side tours like the Amish country, buggy rides, or trips to the zoo. There are many thing you can do to help cut down costs during your road trip. Start by saving on fuel with Gas Buddy. Expand your savings by packing a cooler filled with healthy snacks (low-fat string cheese, fresh fruit, sugar-free applesauce, shelled hard-boiled eggs, and Greek yogurt) and bottled water. This reduces the temptation to fill up on expensive, unhealthy snacks during fuel stops or bathroom breaks along the way. Simple pre-trip activities, such as stopping mail delivery to your home while you’re away and resisting the urge to set garbage cans out ahead of your trip can help hide the fact that you’re planning to be out of town for several days. Also, consider renting a safety deposit box for sensitive documents and valuables that might be tempting for thieves before you head out of town. Safety is important on road trips. Take your vehicle in for a full inspection in the days before your road trip. Make sure you check the oil, radiator fluid, windshield washer fluid, the tires for proper inflation, and even the spare tire for both proper inflation and easy access. Consider a full summer safety inspection from a trusted mechanic. For added safety, don’t forget to pack plenty of sunscreen and a first aid kit for your car. 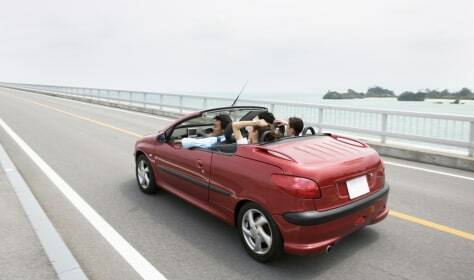 While you’re at it, make sure your auto insurance is up-to-date and adequate for your travel needs. Boredom often sets in quickly on road trips — especially among younger members of the family. You know what that means, right? An endless drone of “Are we there yet?” from the backseat. Consider packing a “treasure bag” for each child before setting out on the road trip. Fill it with age appropriate, car-friendly (and quiet) games, toys and snacks. Don’t forget to bring along travel-friendly tools like tablet computers, DVD players, Nintendo game systems, and mobile devices with trendy apps to keep them entertained as well. It can make a world of difference for your sanity on the long drive. Planning your trip well in advance helps you find little byways and points of interest off the beaten path. Sometimes, getting there really can be half the fun of a family road trip. Following these suggestions helps ensure the journey home is safe as well. Check weather reports for any areas that you will be driving through before leaving home. Knowing what to expect can help you mentally prepare for driving in heavy rain or snow, and help you decide whether you should reschedule your plans instead of taking the risk of driving in a dangerous situation. Keep spare blankets and coats in your trunk at all times. A spare tire seems like the most important thing to have during a blowout, but if you have to wait for roadside assistance during a snowstorm, staying warm will be your top priority. Your headlights should be used during any situation with lowered visibility, even during the day. An easy way to remember this is to automatically turn on your headlights when you start using your windshield wipers, as well as at the first signs of fog. Turn your car’s radio to a station that will keep you updated with any news about approaching storms in the area. This will help you know whether you should continue to drive or stop and wait for bad weather to pass. Never use your phone or other devices that could be distracting while driving. Driving while attempting to operate your cell phone or GPS is always a bad idea, and when the weather is bad this can be even more dangerous. Always program your destination into your GPS before departing. If you receive a phone call that you must take, always wait until you can find a safe place to pull over before answering. Using a cell phone while driving is illegal in many states and The National Safety Council estimates that cell phone use is the cause of over a quarter of crashes in the U.S. each year. Alert a friend or family member when you leave home and arrive at your destination when driving in bad weather. Making a quick call before and after driving during a storm takes little effort and could make a big difference if something unfortunate were to happen. If you begin to feel uncomfortable behind the wheel you should pull over as soon as you can safely do so. Driving with uncertainty doesn’t do any favors for you or for others, so never overestimate your abilities while driving in bad weather. To learn more, contact an independent agent or broker. No one likes to buy auto insurance. It’s complicated. It’s expensive. And who understands how the premiums are determined? Maybe that’s why there is so much misinformation about insurance coverage and pricing. Myth 1: Red cars cost more to insure If you believe the owners of red cars drive more aggressively and get more speeding tickets, this would make sense. But there’s no data to back this up. “Frankly, it doesn’t matter whether the car is red or green or purple,” said Loretta Worters, vice president of the Insurance Information Institute. Insurers are not concerned about color and neither is law enforcement. There does appear to be correlation between vehicle model and the likelihood of a traffic ticket. A recent study by Quality Planning (a San Francisco-based analytics company that works with auto insurers) found that drivers of flashy cars are often more aggressive and therefore a greater risk. Myth 2: Older drivers pay more for car insurance Life insurance goes up with age, but not necessarily auto insurance. In fact, it’s often just the opposite. Many drivers who are 55 or older can get their rates reduced — by up to 10 percent for three years — if they successfully complete an accident prevention course. Check with your insurance agent to find defensive driving courses that are approved by your insurer. If you are retired or no longer working full time, see if you qualify for a discount based on driving less. Myth 3: Your insurance policy covers any damage to your car It doesn’t work that way. Liability insurance (required in some state) covers you if you hurt someone or damage their property. Comprehensive and collision coverage protect your vehicle. That is why this is always optional coverage. Note: It may be required by the lender if you have a lease or car loan. Collisioncoverage pays for damage to your vehicle caused from a collision with another vehicle or object. It also covers damage caused by potholes or if your vehicle flips over. Your insurance company will reimburse you for the cost of repairs (minus the deductible) even if you are at fault for the accident. The National Association of Insurance Commissioners points out that this is relatively expensive coverage, more costly than comprehensive. If you want to fully protect your vehicle for all types of damage, you need to purchase both collision and comprehensive coverage. But many people with older cars sometimes drop these coverages in order to save money. “If the vehicle is worth less than a thousand dollars or less than 10 times the insurance premium, purchasing this optional coverage may not be cost effective,” Worters said. Myth 4: Soldiers pay more for insurance In fact, it’s just the opposite. Members of the military (no matter what branch) qualify for a discount on their auto insurance. In most cases, you’ll need to document your rank and how long you’ll be serving. Myth 5: Your policy covers you if you drive the car for business Personal auto insurance does not protect you if you are self-employed and using your vehicle for business purposes.